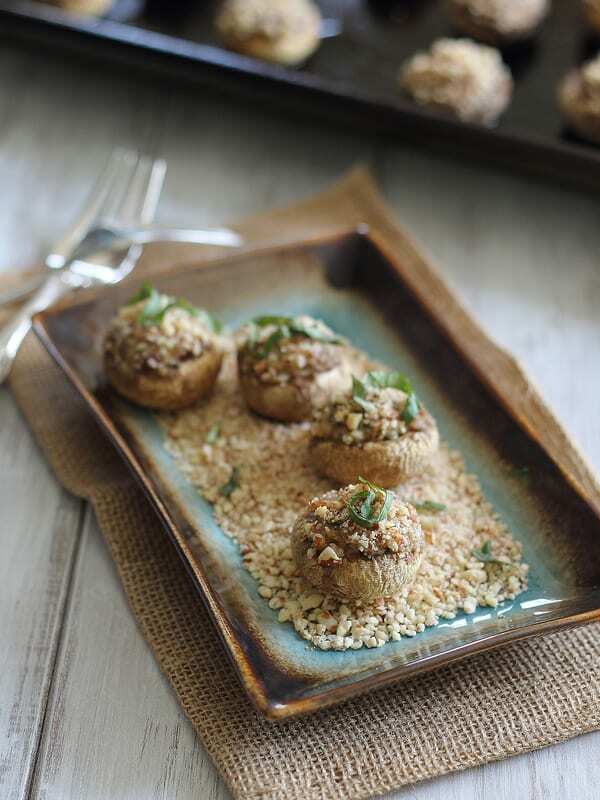 These goat cheese and prosciutto stuffed mushrooms are topped with a garlic almond crumb. Sometimes I’m tempted to just write something along the lines of “OMG, these were sooooo good. The end.” and be done. Would that work? Because here’s the deal, it’s Easter Sunday night as I write this, the house has been cleaned twice in 24 hours (once before people arrived & once after), all the china & silver have been washed by hand, the roast pan has been scrubbed of the slimy, sticky ham glaze stuff (eww), all the leftovers put away and my husband has once again left for the week. I’m physically exhausted from all that and mentally, my brain is still recovering from the brunch conversation that surrounded these little bites of heaven. We covered the state of our nation, the demise of U.S. paper currency, how gold was formed (meteor impact vs. natural resource), the statues on Easter Island, gun laws, the tv show The Bible and the price of replacing a roof. Do you have a headache now too? So here’s what I can say about these before I go pop some ibuprofen and go to bed, the creamy tart goat cheese is perfectly offset by the crispy prosciutto and the mushy/softness of the mushrooms is balanced by the crunchy garlic/almond topping. Throw some basil in there as a kicker and it’s a serious bite sized flavor explosion. That’s a little better than “OMG, these were sooooo good,” right? In a skillet over medium heat, cook prosciutto until crispy. Set aside. Combine almonds and garlic in a food processor and process until a fine crumble forms. Transfer 1/4 cup of the mixture to a small bowl and leave the remainder in the food processor. Add the goat cheese, crisped prosciutto, basil, red pepper and salt & pepper to the food processor. Pulse a few times until everything is combined. 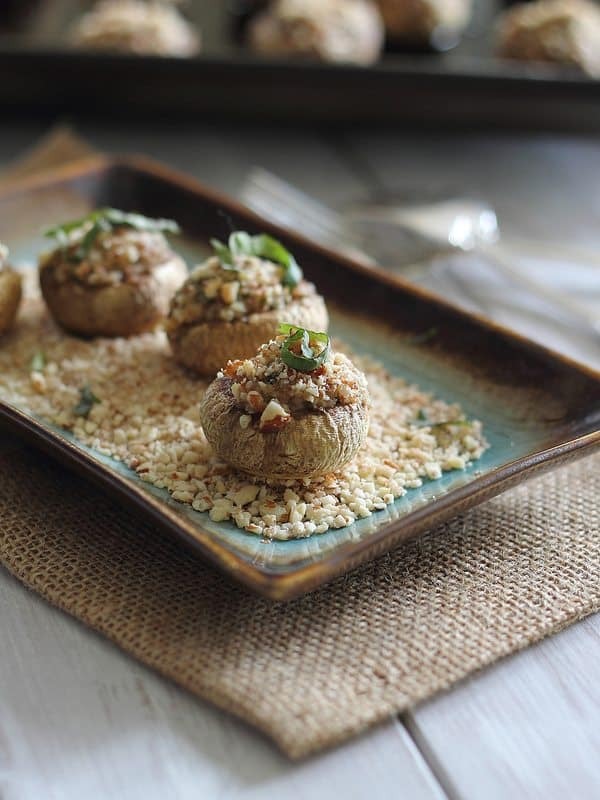 Spoon the goat cheese mixture into each mushroom and then roll the stuffed side of the mushroom in the almond mixture in the bowl. Place the mushroom on the baking sheet. Repeat until all mushrooms are stuffed and rolled. Drizzle mushrooms with olive oil. Bake for 15 minutes. Turn the oven to broil for the last 1-2 minutes for a crispy brown top. These can easily be made ahead of time and re-warmed. They can also be stuffed ahead of time and baked off right before serving. I duno… sometimes I want to just write ‘omg these are amazing, go make them now’ and be done with it. I don’t blame you one bit. I also totally get the post party headache and annoyance but it’s still kind of worth it in the end, right? And these mushrooms… they look so good!! Is it weird that I really like to stuff things? You wouldn’t have needed to write a single thing for me to be obsessed with these. The photos and ingredients speak for themselves! Love love love!!! Such easy, elegant little bites! These look delicious Gina. Your pictures pretty much speak for themselves: these mushrooms rock! Oh my gosh these look amazing. I love stuffed mushrooms. I have a similar recipe that I made vegan, but I kinda wanna make them again and add goat cheese. Great addition. Even if you just left this with “OMG These were so good” I would have totally believed you. I can’t be in the same room with stuffed mushrooms with out hogging the plate all to myself. It’s obscene. Absolutely beautiful! They really do look sooooooooooo good. Thanks for sharing!! Haha, I often want to write the same thing in my posts. These look so good! I’m going to make these the next time I need a good appetizer! That conversation would probably give me a headache too. I cannot handle stuff like that. I like talking about superficial things….like old episodes of Beverly Hills 90210. Also these mushrooms look amazing!!!!! 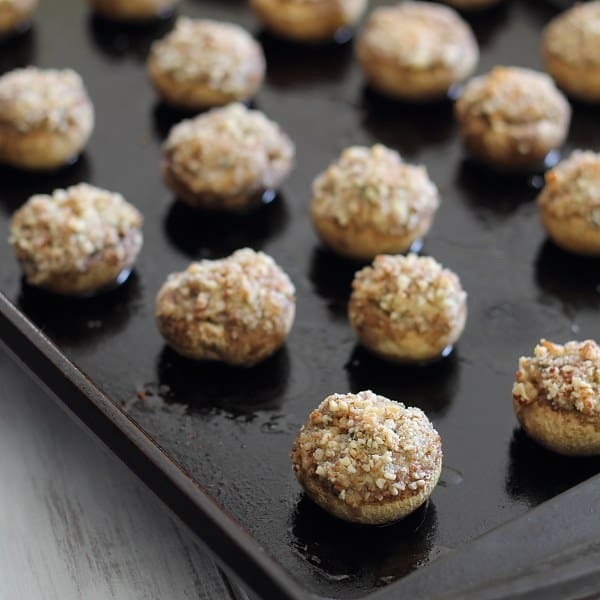 Pingback: Food 101: Mushrooms | wedo.